These companies accounted for a huge portion of the Dow's overall gains. Find out why. 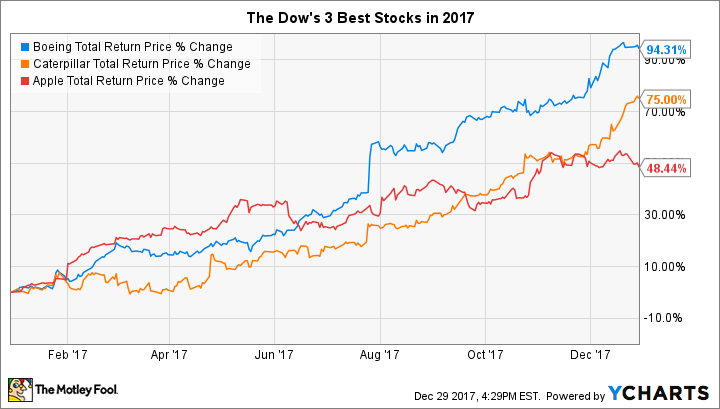 The Dow Jones Industrials (DJINDICES:^DJI) had an exceptionally strong year in 2017, finishing higher by almost 25% and picking up just shy of 5,000 points on the year. That left the benchmark just shy of having the best year in the nine-year-long bull market. What's especially impressive about the Dow's behavior is that a huge portion of its gains came from just a few stocks. In particular, Boeing (NYSE:BA), Caterpillar (NYSE:CAT), and Apple (NASDAQ:AAPL) posted huge gains in 2017, and investors are hopeful that they can carry their positive momentum forward into 2018 and beyond. BA Total Return Price data by YCharts. Boeing easily takes the crown among Dow stocks in 2017, nearly doubling from where it started the year and accounting for more than 1,000 points of the Dow's gain for the year. The aircraft manufacturing giant owes its success to the unprecedented strength of the commercial aerospace industry, where thriving airlines are making massive capital expenditures in order to modernize their fleets and compete more effectively with their rivals. Boeing has picked up large orders at key venues like the air shows in Paris and Dubai. At the same time, favorable conditions in the defense industry have also played to Boeing's strengths in that category. Looking ahead, the most exciting news item for Boeing recently is its apparent consideration of a possible buyout of Brazilian manufacturing peer Embraer (NYSE:ERJ). Embraer's specialty is in regional jets, and bringing that segment under Boeing's corporate umbrella would give the aerospace giant nearly complete coverage of the commercial space. Combine possible strategic moves with expectations for ongoing strength among airlines, and Boeing could see further gains despite a breakout 2017. Caterpillar's recovery has been a long time coming, and even the most patient of investors got tired of the multi-year slump that the heavy equipment manufacturer had coming into 2017. With weakness in construction, mining, and energy, Caterpillar suffered a triple whammy from which it took a while for the company to bounce back. Yet throughout 2017, increasing activity in oil and gas, greater activity in pipeline building, and more construction of both residential and commercial property have combined to give Caterpillar huge momentum. That helped drive the 75% rise in the stock in 2017. Looking ahead, the next catalyst for Caterpillar's success could come from the White House. Washington gridlock early in the year had some worried that a proposed massive infrastructure spending program might never become law, but the recent passage of tax reform proposals has given new hope to those seeking to make infrastructure improvement a reality. Caterpillar would stand to be a major beneficiary of such a bill, and adding that to the already improving picture for its existing customer base would just be icing on the cake for the heavy equipment giant. With a nearly 50% total return in 2017, Apple gets the bronze medal in the Dow this year. Even with the gains, Apple is still well short of the $1 trillion market capitalization that many analysts have looked for, but investors are increasingly optimistic that the electronic device maker will be able to stay on target and produce further gains in the future. Most people focus on the hardware that Apple makes, and new iPhone releases are still major events both financially and from a marketing perspective. Yet Apple has seen increasingly impressive sales growth from its services unit, which includes all the things about the Apple ecosystem that keep customers locked into the brand. The App Store and iTunes are the big players in that space right now, but initiatives like Apple Pay are also gaining traction. That said, the new iPhone X and anticipated smartphone releases in 2018 could help drive Apple stock higher still in the months to come. Investors shouldn't expect the Dow to do as well in 2018 as it did over the past year. Yet with the help of strong components like Apple, Caterpillar, Boeing, the bull market stands a good chance of surviving into its 10th year.